Jerry Lynn Puckett, 80, of Purvis, passed away Sunday, December 2, 2018 at Forrest General Hospital. Services will be Thursday, December 6, 2018 at 10 a.m. at Moore Hattiesburg Chapel followed by burial in Highland Cemetery. Mr. Puckett was a member of First Baptist Church of Purvis and the Elks Lodge #599. He served in the United States Navy. He was a Region Credit Manager for General Electric Credit Corporation for 25 years before retiring in 1983. He was preceded in death by his parents, J.C. and Willie Mae Puckett; one infant daughter, Martha Lynn Puckett; and two brothers, Charles Puckett and John Bill Puckett. He is survived by his wife, Martha Ann Puckett of Purvis; one son, Jerry Lynn Puckett, II. (Cindy) of Prentiss; one daughter, Kimberly Ann Rail of Gulf Shores; two grandsons, William Jacob Rail and Logan Puckett Rail, both of Gulf Shores; and one sister, Rose Mary Myrick of Hattiesburg. Visitation will be Wednesday, December 5, 2018 from 5 – 8 p.m. at Moore Funeral Home in Hattiesburg. 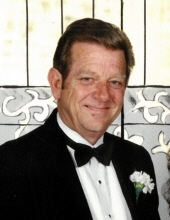 To send flowers or a remembrance gift to the family of Jerry Lynn Puckett, please visit our Tribute Store. "Email Address" would like to share the life celebration of Jerry Lynn Puckett. Click on the "link" to go to share a favorite memory or leave a condolence message for the family.